Yet another milestone has been reached as the Galileo global navigation satellite system inches closer to completion of its entire constellation comprising of 24 operational satellites plus spares in three orbital planes as the last two Galileo satellites of the second tranche were sent to Kourou on May 31. 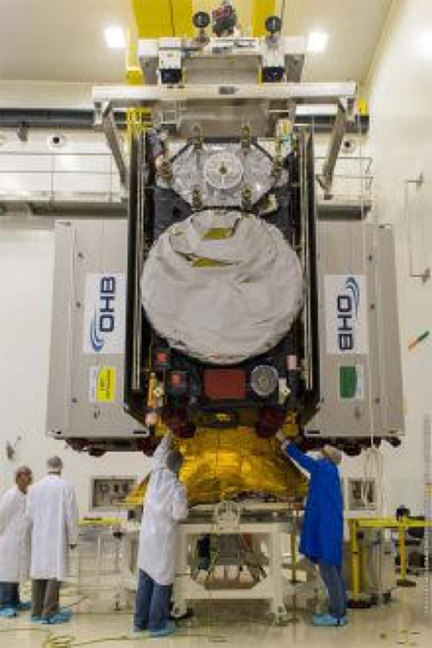 OHB System AG, a subsidiary of aerospace and technology group OHB SE, saw off the last two Galileo FOC (Full Operational Capability) satellites from Batch 2 as they left the factory site in Bremen, Germany at around 12:30 p.m. on May 31. By the end of July they together with two other Galileo satellites will be transported into space in the nose of an Ariane 5 rocket. But before the launch next month, there is the time-consuming and complex transportation by truck to the airport in Luxembourg and then to Cayenne Airport in French Guiana. From there, the two satellites named “Anna” and “Ellen” will be transported to the launch pad. Each satellite is named after one of the children who won the European Commission’s drawing competition in 2011. This means that OHB has now sent off its 21st and 22nd Galileo satellites — 18 structurally identical satellites are already in space. “It was once again perfect teamwork, and I am proud of the Galileo project team that worked on our Galileo satellites until their shipment,” Dr. Manuel Czech, Galileo FOC Project Manager at OHB, said in a press release. Anna and Ellen will be provided with the ideal ambient temperature during transportation: “The average temperature in our production halls is 22 degrees, and the conditions within the containers need to be exactly the same,” says Torsten Uhlhorn, Head of Logistics at OHB. The European Space Agency (ESA), acting on behalf of the European Commission, has awarded OHB System AG with the production of the complete set of 34 Galileo FOC satellites. The entire constellation will comprise 24 operational satellites plus spares in three orbital planes. The constellation is optimized allowing a global position determination and navigation. In addition, the satellites support a global Search and Rescue service (COSPAS-SARSAT). Paetsch provided additional information and comments in a recent interview published on the OHB website. In theory, a constellation has to have at least 24 satellites in three orbits, that is, three different planes in space. This means that a coverage of 100 percent is reached; in other words, a signal is provided for every location throughout the world. And this is how positioning becomes possible. A fundamental issue in signal emission is that at least 24 satellites are required to achieve a specific signal coverage at every point on the globe. On top of this, simultaneous contact with four satellites is required to enable positioning. Substitute satellites, so-called spares, are added to ensure coverage should a satellite run into difficulties. After the launch there will be a test phase, Paetsch explained when asked what comes next after the last four satellites from the second tranche are in space. All told, this phase lasts around half a year. Only then will the satellites go into service operation. At that point, by the end of 2018, the constellation will be complete. Next steps include plans for the first launches of Badge 3 satellites to take place in 2020, meaning that the first of the new Galileo satellites will be built next year. In addition to the 22 FOC satellites there are also the four IOVs, that is, the satellites that were launched into space as In-Orbit Validation satellites to test the technology. Their first launch dates back to 2011. Based on a nominal life time of between 10 to 12 years, these satellites will reach the end of their life span around 2023. It remains to be seen whether spares will have to be launched at that time, but from a certain point onwards risk mitigation dictates that these spares be launched into space. We can assume that, starting in 2020, on average two Galileo satellites will be put into space every year, he explained. Now that “Anna” and “Ellen” will follow “Tara” and “Samuel” to Kourou, racing around the globe, Paetsch was asked if there will be a little bit of wistfulness for the engineers at OHB when it comes to saying goodbye.